The main view in Active@ UNDELETE is Recovery Explorer view. This is the default view that you see after the application starts. It displays the hierarchical structure of all devices and drives, Virtual RAIDs or virtual devices and opened disk images. Scan results also appear here if you scan a device. To collapse or expand an item in this tree, click the arrow sign next to the item name. Recovery Explorer shows its content in several modes, that can be switched by view's toolbar drop-down menu button View. At this mode, all available data storage devices with logical drives are present. At this mode, only accessible logical drives are present. Use this mode to show hierarchy of data storage devices partitioning (including extended partitions on MBR devices). 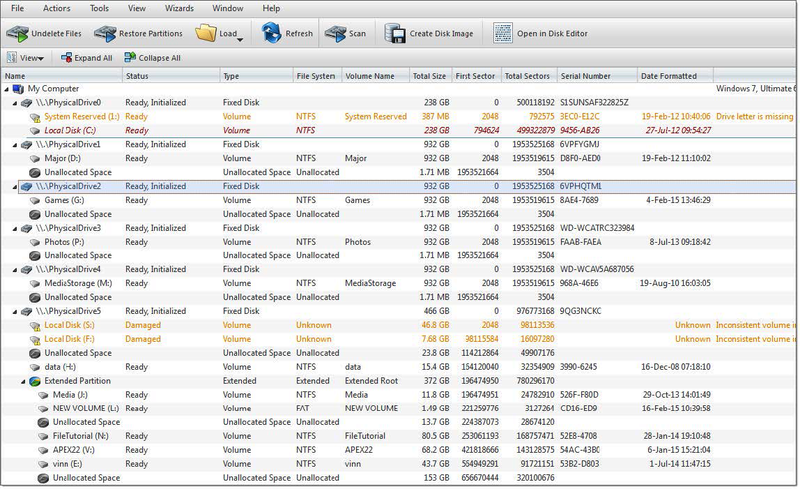 At this mode, all available Data Storage Devices with hierarchy of partitions and logical drives are present; Use this mode for advanced features, such as Advanced Device Scan or Virtual Partition Management. Hides or shows system drive for safety reason. Hides or shows shared network data storage resources. The Properties Panel displays default properties for each selected item. Updates to these properties appear dynamically along with commands and activities performed in the workspace. To toggle the Properties Pane click View > Properties pane. Read Property views for more info.